A regular breeding resident and migrant; occasionally individuals are observed during the winter months. The Field Sparrow was a common species during the Minnesota Breeding Bird Atlas (MNBBA). The Field Sparrow is found from the northern Great Plains in eastern Montana south to central Texas and east from southern New England to northern Florida. It largely occurs south of the densely forested regions of the Great Lakes states and northern New England. Some of the Field Sparrow’s highest breeding densities occur in the central hardwoods of Kentucky, Missouri, and Tennessee and the mixed grass prairie of Nebraska (Figure 1). Assigned a Continental Concern Score of 12/20 by Partners in Flight and classified as a Common Bird in Steep Decline; designated a Species in Greatest Conservation Need by the Minnesota Department of Natural Resources. Only those birds that occur in the most northern reaches of its breeding range, including Minnesota, are migratory. Winters are spent in the southern United States. A ground-foraging omnivore feeding largely on seeds and insects. An open-cup nest. Early in the season, when the season’s foliage is still young, nests are located on or near the ground, hidden amid tufts of grasses or at the base of a small shrub. As the season progresses, new nests are established at greater heights in shrubs and small trees. Although some nests have been reported as high as 4 m above the ground, most are located within 1 m.
Breeding distribution and relative abundance of the Field Sparrow in North America based on the federal Breeding Bird Survey, 2011–2015 (Sauer et al. 2017). Roberts (1932) described the Field Sparrow as a locally common species in the southern third of the state. In the early 1900s it was most abundant in the southeastern counties from Goodhue south to Houston, but records occurred as far north as Sherburne and Isanti Counties in the east (rarely to southern Pine County) and as far north as Chippewa County in the west. It was still an uncommon species in southwestern Minnesota, having first appeared in Pipestone County in 1923. Although there were records farther north in the state, Roberts questioned their authenticity and assigned them to “errors in identification.” His staff at the University of Minnesota had carefully searched for the species in the central and northern regions of the state to no avail. Confirmed nesting records at the time (nests with eggs) were documented in Fillmore, Hennepin, Houston, Isanti, Sherburne, and Wabasha Counties; an inferred nesting record (nests and nest building) was available from Goodhue County. Like many species that were common south of Minnesota, the Field Sparrow slowly expanded its range northward following the Mississippi River valley. Roberts first encountered the species in Ramsey County in 1884. By the late 1920s, when he was writing his treatise on Minnesota birds, the Field Sparrow was already established as a regular summer resident in the Twin Cities region. Little had changed by 1975 when Green and Janssen published an updated account of the species. Summer records had been reported as far north as Otter Tail, Itasca, and southern St. Louis Counties, but nesting evidence was still confined to southeastern and east-central Minnesota. Several years later, in 1987, Janssen reported the species as a resident throughout southern and central Minnesota, although still most numerous in the southeastern and east-central regions. It also was “well represented” along the Minnesota River valley as far as the South Dakota border. Although nesting had yet to be confirmed north of Morrison County, an increasing number of reports from northern counties included Aitkin, Hubbard, and Itasca. Janssen identified 19 counties where nesting had been confirmed since 1970. Hertzel and Janssen (1998) would later add an additional 2 counties to the list. The Minnesota Biological Survey reported a total of 570 breeding season locations for the Field Sparrow during the course of its field studies. Although reports in northern Minnesota remained rare, the species was reported at several locations in Hubbard County and as far north as southern Polk County. Records were common throughout southern Minnesota, including numerous records across the Prairie Coteau region in southwestern Minnesota (Minnesota Department of Natural Resources 2016). During the MNBBA, observers reported a total of 1,039 Field Sparrow records in 11.3% (536/4,741) of the surveyed atlas blocks and in 15.0% (350/2,337) of the priority blocks. Breeding evidence was documented in 46 blocks (Figures 2 and 3; Table 1). The species was reported in 73 of Minnesota’s 87 counties (several blocks straddled Nicollet and adjacent counties along the Minnesota River; one block straddled Wright and Hennepin Counties) and were confirmed nesting in 32 counties. Three atlas blocks with confirmed nesting straddled 2 counties each: Hennepin/Wright, Blue Earth/Nicollet, and Brown/Renville. Of the counties where nesting reports had been confirmed, 16 had not been previously reported by Hertzel and Janssen (1998). A probable breeding record was found as far north as southern Koochiching County, and several possible breeding records were found in Itasca, southern Beltrami, northern Hubbard, and northern Cass Counties. The northern limit of confirmed breeding occurred from Isanti and Sherburne Counties in the east to northern Morrison and central Otter Tail Counties in the central and western regions. The Field Sparrow was most frequently reported from the Paleozoic Plateau Subsection of southeastern Minnesota. The MNBBA predicted distribution map illustrates that the highest breeding densities are predicted to occur in southeastern Minnesota, especially from Goodhue County south to Houston and Fillmore Counties (Figure 4). The Anoka Sandplain Subsection north of the Twin Cities, as well as portions of Washington County, also support moderately high densities with scattered pockets occurring as far north as Otter Tail and Wadena Counties. Overall, the Field Sparrow is predicted to be most frequently encountered in the Eastern Broadleaf Forest Province and along the Minnesota River valley. Scattered areas of higher abundance are also predicted in south-central and southwestern Minnesota. Although the MNBBA did not detect the species in the far northwestern corner of the state, the model suggests that suitable habitat may be available in small areas. The Manitoba breeding bird atlas, conducted between 2010 and 2014, did document the Field Sparrow in four blocks in the very southern region of the province, just north of Minnesota, including one probable breeding record (Bird Studies Canada 2017). The accumulated evidence documents that the Field Sparrow has continued its northward range expansion in Minnesota at a rather slow pace over the past one hundred years. The expansive peatlands and dense forests of north-central and northeastern Minnesota, however, continue to provide a barrier to this open woodland and forest-edge species. Elsewhere in its breeding range, few large-scale changes have been noted in its overall distribution. Cutright et al. (2006) documented the species’ broad distribution across the southern two-thirds of Wisconsin, noting that the species has “presumably” always occurred in the state. Historic accounts of its presence in Michigan also document its common occurrence since the early 1900s throughout the Lower Peninsula and in the eastern and central regions of the Upper Peninsula. Recent atlases in the state have documented little change in its distribution in the past century (Chartier et al. 2013). Breeding distribution of the Field Sparrow in Minnesota based on the Breeding Bird Atlas (2009 – 2013). Summary statistics of observations by breeding status category for the Field Sparrow in Minnesota based on all blocks (each 5 km x 5 km) surveyed during the Breeding Bird Atlas (2009-2013). Summary statistics for the Field Sparrow observations by breeding status category for all blocks and priority blocks (each 5 km x 5 km) surveyed during the Minnesota Breeding Bird Atlas (2009-2013). Predicted breeding distribution (pairs per 40 hectares) of the Field Sparrow in Minnesota based on habitat, landscape context, and climate data gathered during the Minnesota Breeding Bird Atlas (2009-2013) using the General Linear Modeling method with an adjustment for detectability. The Field Sparrow depends on successional habitats that include abandoned farm fields, hedgerows, shelterbelts, and woodland edges (Figure 5). Shrub grasslands are generally preferred. When shrubby edges of woodlands are selected, the birds rarely venture more than a few meters into the woods or more than 12–15 m into the adjacent grasslands or fields (Dechant et al. 2002). Habitat data collected within 200 m of MNBBA point counts where the Field Sparrow was detected emphasized the species’ preference in Minnesota for woodland edges. Oak woodlands were the dominant cover type, followed by upland grasslands (Figure 6). Overall, the most important habitat components are dense grassy cover of moderate height (<40 cm) and woody vegetation. Dechant and her colleagues ( 2002) described the optimal habitat as being larger than 2 ha and comprised of “dense, moderately tall grass, low to moderate shrub density with 50-75% of shrubs <1.5 m tall, and shrub cover 15-35%.” Structural features appear to be more important than patch size, since sites smaller than 2 ha may be used. Patchiness within the habitat is also important; sites with scattered patches of shrubs are preferred over continuous cover, as are sites with more diversity in the vertical layer of vegetation (Dechant et al. 2002). At the landscape scale, one of the most consistent characteristics of the Field Sparrow’s breeding habitat is its distance from human habitation (Carey et al. 2008). Across North America, abandoned farm fields are one of the most common habitats to find Field Sparrows. The birds usually occupy the fields 1 to 2 years following abandonment. The number of breeding pairs increases for about 10 years until, approximately 30 years later, the sites are overgrown with trees and shrubs and no longer provide suitable habitat (Carey et al. 2008). Typical breeding habitat of the Field Sparrow in Minnesota (© Lee A. Pfannmuller). Habitat profile for the Field Sparrow based on habitats within 200 m of point counts where the species was present during the Minnesota Breeding Bird Atlas (2009-2013). Data collected by the federal Breeding Bird Survey (BBS) generated a continental population estimate of approximately 9.2 million breeding adults, only a small fraction of which occur in southern Canada (Rosenberg et al. 2016). In 2013, 0.90% of the continental population was estimated to reside in Minnesota, which would generate a current statewide estimate of approximately 83,000 individuals (Partners in Flight Science Committee 2013). The MNBBA estimated a statewide population of nearly 348,000 individuals (95% confidence interval of 266,000 – 625,000). Located near the northern periphery of the species’ breeding range, breeding densities in Minnesota are considerably lower than those found farther south. An average of less than 1 Field Sparrow is detected per BBS route in the state each year. This compares to an average of 33 birds per BBS route in Missouri, 26 in Kentucky, and 25 in Tennessee (Sauer et al. 2017). Local breeding densities vary widely but range from approximately 21 pairs to 78 pairs per 40 ha on abandoned farmland in Michigan (Carey et al. 2008). In Minnesota, local densities rarely exceed 10 pairs per 40 ha (Figure 4). Perhaps the most notable feature of this rather plainly attired little sparrow is its precipitous population decline. From 1966 to 2015, BBS data have documented a significant annual decline of 2.33% per year across North America (Figure 7). 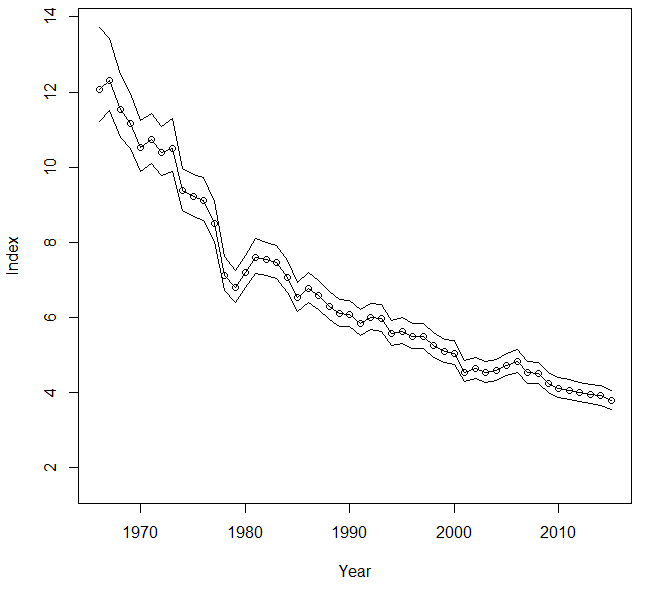 From 1970 to 2014 it has experienced a cumulative decline of 62%, prompting its listing by Partners in Flight as a Common Bird in Steep Decline (Rosenberg et al. 2016). The decline is nearly range-wide; the only significant areas showing an increase are in the central Great Plains and portions of Alabama and Mississippi (Figure 8). Because it is encountered infrequently along BBS routes in Minnesota, analyses of its statewide population trend lack statistical precision. Regardless, Minnesota BBS data suggest a plummeting population nearly equal in magnitude to that detected across North America, with a significant annual decrease of 1.85% per year (Sauer et al. 2017). Loss and degradation of its ephemeral, successional habitat are considered the principal factors responsible for the sparrow’s decline. Because it is intolerant of human-dominated landscapes, its habitat is permanently lost as suburban and urban growth continue to expand. The ephemeral nature of its preferred shrubby habitat also results in its complete loss unless other disturbances establish new sites. In the northeastern United States, for example, the well-documented loss of farmland and its consequent reforestation may have initially created increased opportunities for the species; but, as time passed, succession closed the forest canopy and eliminated suitable habitat. In contrast, in the grasslands of the Great Plains, shrub invasion of sites that are not intensively managed to prevent succession (e.g., on Conservation Reserve Program lands) is a benefit to the species and may be contributing to the Field Sparrow’s healthy populations in this region. Breeding population trend for the Field Sparrow in North America for 1966–2015 based on the federal Breeding Bird Survey (Sauer et al. 2017). Population trend map for the Field Sparrow based on federal Breeding Bird Survey data, 1966–2015 (Sauer et al. 2017). Although the Field Sparrow is still relatively abundant, Partners in Flight not only designated the species a Common Species in Steep Decline but also assigned a moderately high Continental Concern Score of 12/20 in light of its declining population (Rosenberg et al. 2016). In Minnesota the Field Sparrow has been designated a Species in Greatest Conservation Need (Minnesota Department of Natural Resources 2015). A warming climate is not considered to pose major problems for the species. The State of the Birds 2010 Report on Climate Change classified it as having a low vulnerability to climate change (North American Bird Conservation Initiative 2010). A recent assessment of the vulnerability of nearly 600 North American birds by the National Audubon Society did not include the Field Sparrow (Langham et al. 2015). Specific management recommendations focus on retaining some woody vegetation in grassland areas and conducting management burns on a rotational schedule. This allows the retention of woody vegetation and dense herbaceous cover in a portion of each managed area for nesting sparrows. Because Field Sparrows will nest in crop residue, conservation tillage should maintain at least 30% of the crop residue to encourage nesting (Dechant et al. 2002). The Field Sparrow’s sweet song is one of the most pleasing sounds heard in fields scattered throughout the deciduous woodlands of southern and central Minnesota each summer. Despite its declining population, the sparrow’s future in the short term appears secure. As records in southern Manitoba suggest, we may even witness a continued expansion of its current breeding range farther north in the coming years.